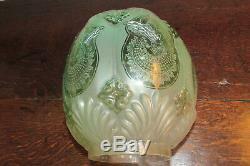 Offered for sale antique etched green colour glass oil lamp shade large bee hive shape, very nice moulded/frosted/etched and polished body decoration. Very good condition , nice loud ring tone to the touch, there might be minor edge nibbles to the base rim, top edge fine, and nothing to detract. Base rim, 7 & 3/4 high. 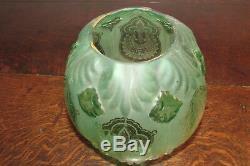 Do Look at our other oil lamp listings. 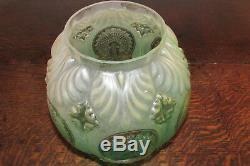 The item "Arts & crafts Art Deco etched green glass bee hive shape Duplex oil lamp shade" is in sale since Sunday, February 3, 2019. This item is in the category "Antiques\Antique Furniture\Lamps\Victorian (1837-1901)". The seller is "dadsoldstuff" and is located in *.